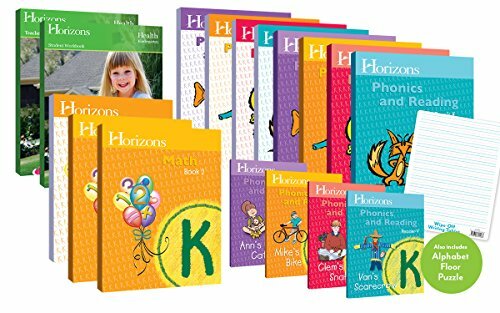 This Horizons five subject curriculum set contains everything you need to launch your students Kindergarten year: Curriculum for Math, Phonics & Reading, Health, Spelling & Vocabulary, and Penmanship. Horizons is an award winning curriculum, renown for its bright illustrations, captivating content, hands-on activities, and solid results. Your student will love the colorful workbooks with removable pages; parents will love the easy-to-use teacher's guides with must-have daily planners, lesson schedules, and clear objectives. This popular Christian homeschool curriculum is based on the Bible and integrates scripture and Christian living into all subjects. Horizons uses a spiral learning methodology to help your student master concepts through the process of introduction, review, and reinforcement. This way of learning allows students to quickly grasp concepts in a motivating format. Perfect for hands-on learning, Horizons is a winning combination of fun, entertainment, and academic success. This popular Kindergarten program sets the stage for future learning. The full Horizons curriculum set contains everything you need to launch your students kindergarten year including: Horizons Kindergarten Math Give your child a solid foundation in mathematics with award-winning Horizons Kindergarten Math! Filled with 160 attention-grabbing lessons, this easy-to-use curriculum includes two colorfully illustrated student books covering adding, subtracting, and more; plus a helpful teacher's guide with daily lesson plans, answer keys, and worksheets. With the Horizons Kindergarten Math, you'll find everything you need. Children love learning through analytical reasoning, memorization, and drills in this best-selling math curriculum. Each engaging lesson begins with a new math concept or an expansion on a previously covered concept to ensure your child's educational success. Brightly-colored illustrations in this Alpha Omega curriculum help your child understand basic math skills such as counting, adding, and subtracting single digit numbers; money values; time and days of the week; direction and positions; simple fractions; and more! The user-friendly teacher guide provides step-by-step instructions and teaching tips ensure to have help and find success in teaching elementary math. Horizons Kindergarten Phonics and Reading Fast track your child's reading abilities with the colorful, highly acclaimed Horizons Kindergarten Phonics & Reading course from Alpha Omega Publications. Your child can develop good reading skills quickly as they identify the names and sounds of letters through exciting stories and picture association. Four student workbooks contain 160 fun-filled lessons with removable, perforated pages that systemically present consonant sounds and blending, vowel sounds, consonant beginnings and endings, syllables, diphthongs, digraphs, and non-phonetic sounds. In addition, four colorful, companion readers correspond to each workbook in this homeschool curriculum with easy-to-read stories that contain words demonstrating the primary concept of each lesson. Just imagine how proud your kindergartner will be as he reads each exciting story with little or no assistance from you! This appealing, hands-on course also contains helpful teacher's guides with a daily lesson planner, teaching tips, duplication masters, answer keys, and additional worksheets. Daily lesson plans clearly outline specific goals, supplies, and activities to make teaching your child to read easy and fun. What's more, you'll save on paper costs as your child practices writing phonics rules on the handy, wipe-off tablet. And your child will love all the phonics games that can be played with the colorful, alphabet floor puzzle. Horizons Kindergarten Health Students will learn about essential health topics with colorful and print-based lessons. This course comes with a soft-cover teacher's guide and a consumable student workbook that explain God's will for healthy living to young children. Age appropriate and easy to teach, this Christian-based course lays a solid foundation for healthy living by using puppet dialogue and lesson activities to examine topics like living with family, getting along with others, friendship, being safe, and taking care of the body. The step-by-step teacher's guide includes 48 lessons, along with a list of needed materials, objectives, lesson overviews, related activities, and more! Designed to be taught two to three days per week, Horizons Kindergarten Health includes a student workbook with over 40 colorful student visuals and activities. Perforated for easy removal, these resources complement topics presented using the teacher's guide. The course's activities include pictures to color, matching and identifying objects, cutting, and tracing letters. Starting your child's health lessons at an early age will help ensure they build good habits, values, goals and behaviors as they grow older.